I am more excited than a child at Christmas! I cannot believe how good hobbycraft are! They’ve only managed to go and get CARON CAKES!!! If you’re from the UK you will know that you’re only chances of getting Caron cakes is if you either fly to the US and go to a Michaels store or buy them from eBay at £30 each! 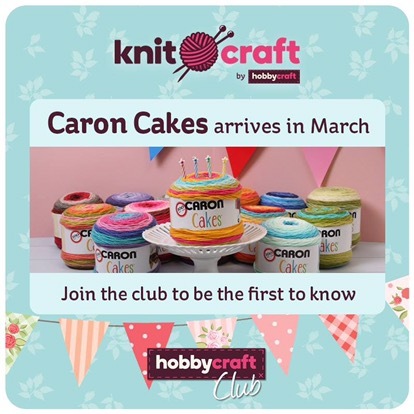 They’ll be in during March, at some point, for quite some time Caron gave Michaels exclusivity, but not anymore!!! Right, time to get some of my wips done and make some room for my new stash! This has made me really happy!!!! Oh my gosh! This is the best news ever! I am too excited! Eek how exciting! I cant wait! I bet it’s just as much fun squishing them!! They’re here!! Ha ha! Have you managed to buy any yet? I love them! Doh I’ve read your blog post now, glad you’ve got some!